With the three different species worldwide, the peacock, also known as the peafowl, lives naturally in Africa, Australia and parts of Asia. The medium sized, exotic bird is one of the most recognizable animals on the planet for its distinctive physical features. It spends much of its time on the ground in search of grains, seeds and insects. Peacocks can live up to 20 years old and are one of the more prized game birds in the world. 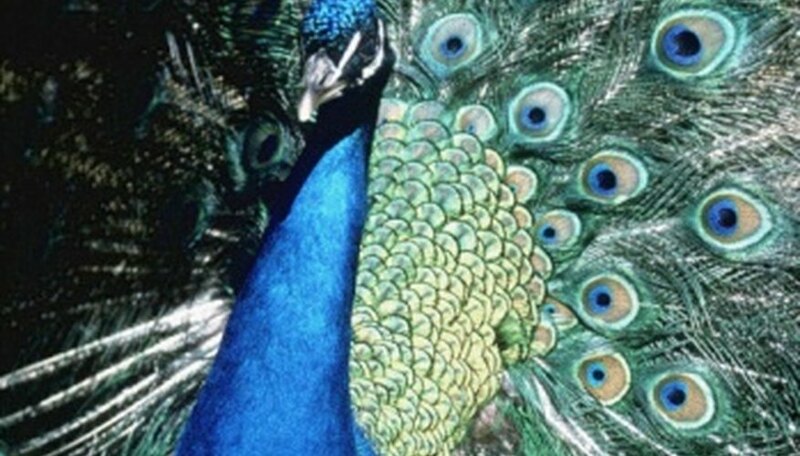 The male peacock's plumage accounts for more than 60 percent of its total body length. It can reach more than six feet. 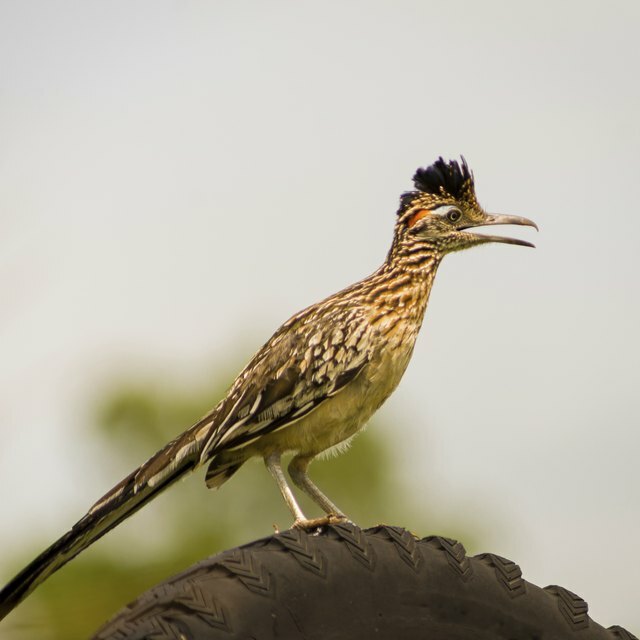 Males fan their feathers when trying to court females and also in defense against male counterparts. Females peacocks, also known as peahens, often select mates depending on the size of that tail fan. Peacocks shed feathers during molting season, giving opportunity for collection. It's not just the size of the peacock's plumage that makes it special, but the eye on its tail feathers that set it apart physically from other medium-sized birds. Most males have upwards of 150 feathers, with the "eye," which is usually a bright green, blue and gold, sometimes brown and in rare cases, white. Because of it's elaborate styling, people use the peacock's tail feathers for a variety of decorations, including masks and jewelry. 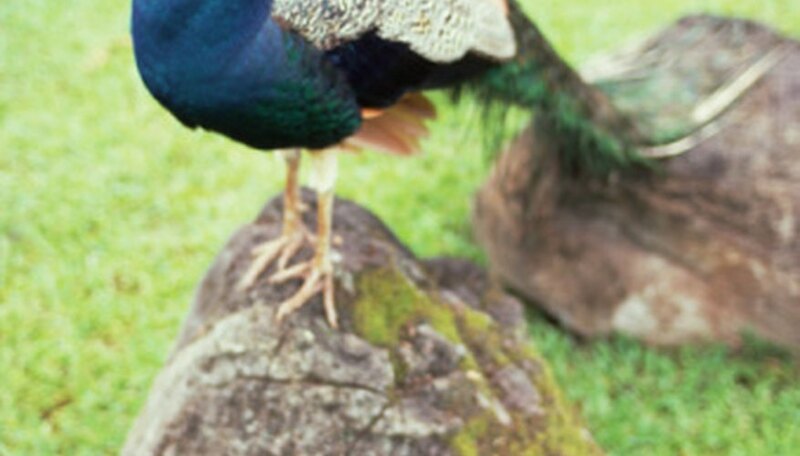 Male and female peacocks alike have a blue crest on top of their head, though it is not known to serve a purpose. The bird, which has an exotic blue body to go along with its distinct tail feathers, can reach 5 feet in height and more than 4 feet in width, while reaching a maximum weight of 13 pounds. To supplement its normal diet of grains and insects, peacocks will occasionally eat small mammals and reptiles. The male peacock mates with up to six different peahens every mating season. Females lay up to 8 eggs, incubating them over the course of a month by sitting on them. Peahens rear babies without the help of the male. Wild dogs, tigers and raccoons are predators peacocks fear. Ruland, Greg. "Peacock Features." Sciencing, https://sciencing.com/peacock-features-8567066.html. 25 April 2017.